The Kansai Association of Corporate Executives issued a six-point series of proposals on Tuesday with the aim of making the anticipated Yumeshima IR into a major success for the region’s comprehensive development. First and foremost, the association stressed the financial importance of having the IR open its doors before the start of the World Expo in May 2025. To this end, they made three appeals: that the national government accelerate the process of selecting the three regions to be licensed; to expedite legal processes related to permits, environmental impact assessments, etc. ; and to speed the actual construction through effective public-private coordination. A second section of the statement stresses that a proper decision-making structure must be used to select the IR operator partner. The process must be transparent, objective, and all of the individuals directly involved in the selection process must be entirely free of any interests connected to one operator or another. 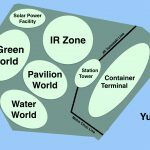 Another proposal is to create a public-private “MICE Attraction and Creation Organization” well before the facilities at the Yumeshima IR have actually opened, in order to ensure that the whole project can hit the ground running as soon as conference centers and halls have been erected.